Bullied Oskar's coming of age story is different to most children's experiences. This is a vampire movie, which doubles as a heart-breaking tale of pre-teen love. 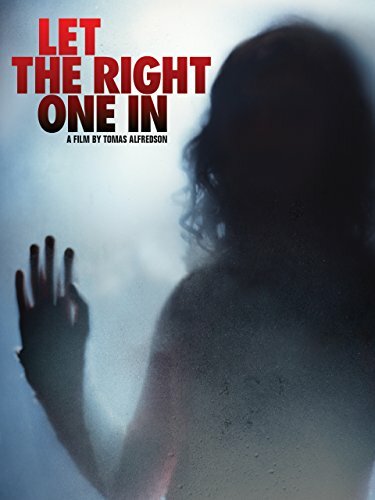 'Let the Right One In' is a Swedish vampire film. It may end up being the best in the genre for the entire 21st century. Anything that follows has a long way to go to beat it. As soon as I began my recent interest in all things vampiric, I had people telling me to watch this movie. After the first such recommendation, I put it on my vague 'to see one day' list. By the tenth, I couldn't ignore it any longer. They were right. Every single person who pressed me to find 'Let the Right One In' was absolutely and without question correct. I've now joined their ranks. Watch it. Very few people had a first love as dark as this. Kåre Hedebrant and Lina Leandersson keep us riveted, as they bumble through their adolescent romance. Everyone who was ever bullied at school will identify with Oskar. The quiet courage in not breaking down, even as a gang of boys try to break him, marks Oskar as a hero from the start. Though it kills us to watch him go through that. His isolation from his peers shows in his loneliness, hanging around an empty playground close to home. A new girl has moved in next door. Overlooked by dozens of apartment block windows, the two twelve year olds begin a tentative friendship. It's both excruciating in its awkwardness and simultaneously heart-warming, as contact is made. But all of this is against a backdrop of a wider fear on the estate. Bloodied corpses are being uncovered in the snow. Bodies are found hung upside down from trees in the woods. Their throats were slit. Their blood was collected in a plastic bottle. Oskar's mother wants to keep her son close, in case the murderer snatches him too. Eli's guardian has no such fears. As for the bullies... *smile* There are some truly cathartic moments involving them. Bullied children everywhere will want to be holding Oskar and Eli's coats. The official trailer was appalling and misrepresented the movie completely. So I've substituted a scene from the film instead. This perfectly paced horror/romance movie reveals its secrets slowly. But always at the best time to do so, leaving us gasping for more. It's rare that you can say that a horror film is beautiful. This one is a work of art. John Ajvide Lindqvist, who wrote the novel upon which it is based, also penned the screenplay. There's a terrible realism about everything that occurs, even as the Gothic romance is playing out. The film relies on lighting gradually teasing out the darkness. The shots are as much atmospheric as they are story-telling. The music is complementary and never distracting. It wonderfully matches the mood of the whole movie. Apparently director Tomas Alfredson was casting for a year, all over Sweden, before he found his two young stars. Kåre Hedebrant (Oskar) and Lina Leandersson (Eli) were only eleven years old, when they acted in this movie. That fact astounded me. Their performances have a mature subtlety that had me convinced that they were older, acting younger. Only the physical reality of their obviously prepubescent forms had me stumped. But no, they were actually a year younger than their characters! They were both nominated in the Breakthrough Performance category of the Online Film Critics Society Awards. Lina won it. In addition, they've been nominated for dozens of other movie awards for Let the Right One In. They deserved it. They were both utterly believable in their roles. Kåre was in practically every scene, and this wasn't a simple story-line. Color me impressed. Yvonne, Virginia and several other female cameos could have pulled this one off. They didn't. I'm gutted about this! 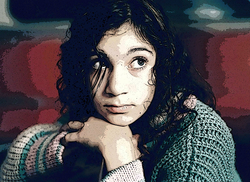 There are strong female characters in Let the Right One In. They have names, but they never talk to each other. Some of the most memorable scenes in the movie involve its women. But again, not simultaneously. How difficult would it have been for Yvonne (Oskar's mother) to speak with his teacher about his bullying. Ok, Virginia couldn't have done that, as they were played by the same actress! But Yvonne and Virginia surely had things to say to each other in the street. There were bodies turning up and they were neighbors! Even a quick, 'Hello! How are you?' 'Fine, apart from this strange boil on my finger...' kind of conversation would have covered it. There was even a tantalizing moment, when Virginia met Eli, when the Bechdel Test could have been passed. But their jaw-dropping encounter happened with non-verbal communication. Until Lacke turned up, and Virginia seemed to remember how to speak. All in all, a disappointing Bechdel Test fail this time. Francis Ford Coppola directed this star-studded cast through the most faithful movie adaptation of 'Dracula' thus far. Gary Oldman stole every scene. David Bowie, Susan Sarandon and Catherine Deneuve fight for top billing, in this art house, New Romantic vampire movie. I've since watched 'Let Me In'. It's close enough to feel like the same movie, but the horror is much more horrific. It's more like a horror film, than a coming of age film. A lot of the subtlety got lost. Neither are bad films though. I guess it comes down to own personal choice on which is the best. Apparently there was a US remake two years later called 'Let Her In'. I've heard really bad reviews about it. I'm half tempted to watch it, but don't want to ruin the Swedish film in my head. Amazing film and certainly among the best vampire themed films ever. I totally agree that 'anything that follows has a long way to go to beat it'.